Scientific Name(s): Cercis canadensis L.
Photographed last April at Riverview Arboretum, the small cluster of Cercis canadensis plants there provide a showy (though small) display, even on grey rainy days. The genus Cercis is comprised of approximately a dozen species of deciduous trees and shrubs, native to North America, Europe and Asia. The species can all be recognized by their alternately arranged, often glossy, heart-shaped leaves and especially their flowers, which are produced before leaf emergence in showy inflorescences both on the current season’s shoots and directly out of mature branches, including the dark, heavily textured trunks of older trees. This habit of flowering out of old wood, seemingly randomly and where no buds are visible, is known as cauliflory (caul = stem + flory = flowering) and is primarily restricted to woody plants of the tropics. 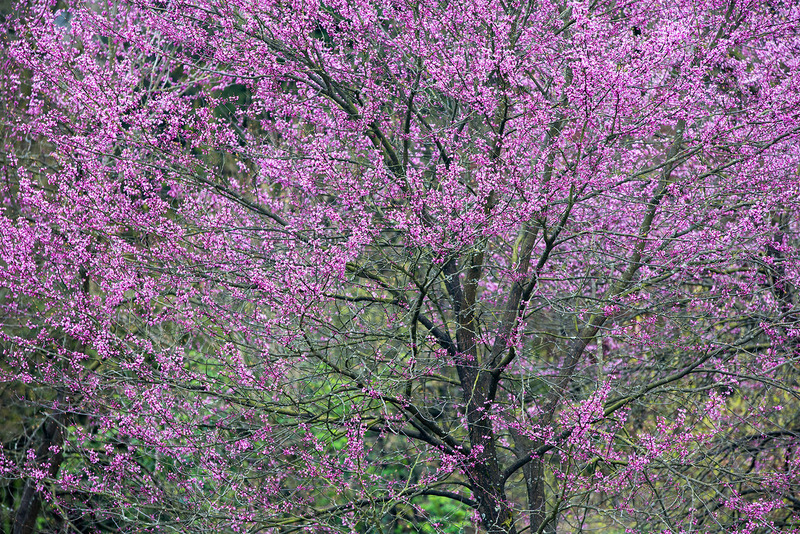 Redbuds are members of the legume family (Fabaceae). The flowers are bee pollinated and much like typical pea flowers, although there are some botanically important structural differences. Other notable departures from typical pea characteristics include: no nitrogen-fixing, root-nodulating bacterial association, and simple leaves. Most legumes form mutualistic associations with a nitrogen fixing bacteria (Rhizobium spp.) and have compound leaves. The species are nonetheless much like other woody pea family members, with papery leguminous fruits, and a general preference for warm, dry conditions. In those species that grow large enough to be considered trees, crown shape is usually rounded, ultimately flat-topped, but irregular and often messy, with several upright branches competing with existing uprights for dominance. The name Cercis is derived from the Greek, kerkis, a weaver’s shuttle, to which Theophrastus likened the flattened legumes of the European Cercis siliquastrum. In the Vancouver area, Cercis canadensis (eastern redbud) is the most commonly cultivated Cercis species. It is native to eastern North America, from Ontario south to the Gulf of Mexico. The typical form produces a strongly rounded crown of lush, green, heart-shaped, pointed leaves that turn yellow in autumn. In spring the lavender-pink flowers are borne all over the stems and a tree in bloom can be spectacular. You can read more about Cercis canadensis via Missouri Botanical Garden: Cercis canadensis or the North American Native Plant Society: Cercis canadensis. On to some housekeeping: I’ve added a page with links to month-by-month archives of previous entries. If you visit that page, you’ll see I make note that I have a huge task ahead of me in updating / revising old entries to conform to this software. The good thing about the task is it also forces me to correct / replace out-of-date links. Have a visit through the repaired entries from April 2005 if you have the time! The month-by-month is a fantastic resource. Is the Vancouver Trees App available for Android yet? Will it ever be? There’s still a desire to complete it, yes. I understand that the simple leaf of Cercis spp. is considered to have evolved from the fusion of two leaflets. The bifid leaf of Bauhinia spp. is illustrative of incomplete fusion. This species is one that really made a strong impression on me as a kid growing up in Cincinnati. I was especially facinated (and still am) by their propensity to send inflorescences out from even larger trunks. They are associated with spring for me. Next to my driveway at my property outside of Scappoose, Oregon, there is one I dug out from grandparents yard in Greenhills, Ohio and brought back with me. It bloomed for the first time last year and I am now greatly looking forward to it’s display this year. Oh My, what an amazing display. One of my favorite small trees here in the northeastern U.S. The flowers are edible and taste mildly pea-like, and make a beautiful addition sprinkled onto salads when in season. The fruit (legumes) are also edible when small and tender – they never get very big even when mature. One of my very favourite small trees/shrubs, Daniel (and Douglas). I grew up with it in Illinois, and I keep looking for a seed source from the extreme north and west of its range that would tolerate the dry and cold of an Edmonton Wnter. What a great post. I learned so much about one of my the plants that I remember best from my midwest childhood. I rarely get to see it as I live in NH. (Wish I could try the flowers in a salad.) Fun to see how many others have been impressed by this plant. We have them here in Texas. This year they didn’t put on their usual spectacular show, although last year the redbuds were amazing. I had no idea the flowers and pods were edible! I think Texas has a different species or subspecies, but that’s just from memory. I’d have to go look. I’m thinking i might have to try the flowers out. Denis, most sources current list the Texas variety as a subspecies of C canadensis. I just consider it a big muddle to still be sorted out… again and again (I am not a fan of messing with botanical names). Basically, the texensis subspecies has thicker, shiny foliage that is resistant to insect, disease, and environmental damage. There is a naturally occurring variety found in Oklahoma and was given the name ‘Oklahoma’. It is GORGEOUS in spring. I planted three redbuds in our parking strip in Portland OR. They are beautiful in bloom and turn such a nice yellow in the fall. They were not real common here when I planted them, but now you see more of them here. The bad news is that they are susceptible to verticillium, and I have lost one of them. I’m not sure if the other two will follow suit, hope not. I had a Cercis occidentalis planted in the parking strip of my old house in the St. Johns neighborhood. I might have to drive by and see if it’s still going there on N. Trumbull. We are very lucky to have over 30 redbud (of various ages) growing native in our 2+ property. I am the coordinator for the Rogers County Master Gardeners through the OK State University Extension Service. We are giving our 300 free redbud trees to attendees at the Claremore Home and Garden Show this weekend, What a timely entry to the “Botany Photo of the Day”! Thanks for that and the great information on this great tree. It is Oklahoma’s state tree- and I didn’t know they are grown in B.C. However it makes perfect sense- being in zone 8b. Seems to do OK here in central Connecticut. The coloration is such a pick-me-up! 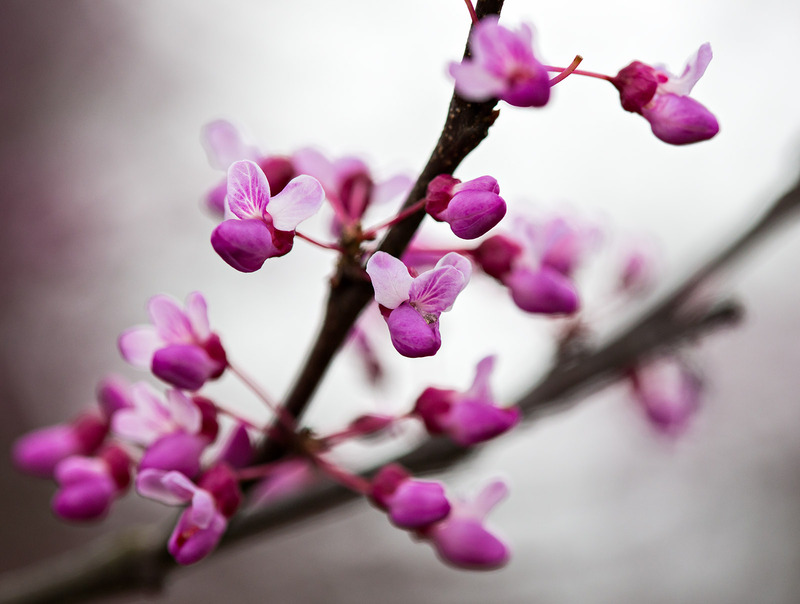 Thanks for the post on Cercis, such a wonderful sight when our eyes are starved for color after winter. I planted a Forest Pansy redbud a few years ago and I also allow naturally occurring plants to stay if they are likely to behave. So, the birds have given me a few eastern redbuds. 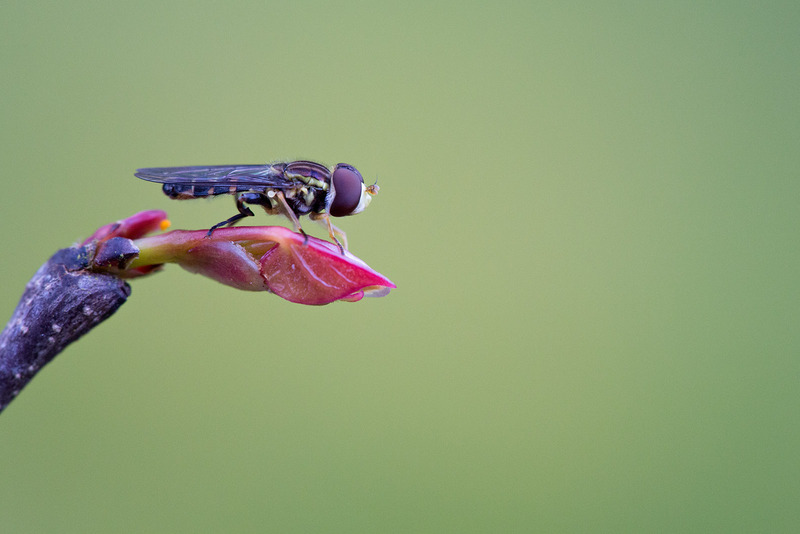 One Spring, I was contemplating a space in a flowerbed and heard a loud buzzing. I looked up and found the native redbud LOADED with hungry honeybees. I checked the Forest Pansy, no bees. I can only assume they bred part of the flower out of the Forest Pansy, and it is not interesting to insects. The Forest Pansy eventually declined and had to be removed. The native redbud had an added benefit this year. When I was looking for bees (and seeing a few), I also saw a male cardinal. He was eating something in the blooming tree. I was unable to figure out if he was eating bees, a different insect visiting the flowers, or the flowers themselves. It was a good feeling knowing my tree is part of the ecosystem and not just a pretty flower.